Jeremy Horne is an American wide receiver for the Kansas City Chiefs. 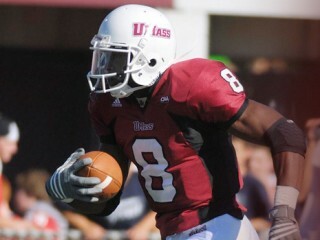 Horne entered the NFL as an undrafted free agent wide receiver from the University of Massachusetts in 2010. College: Saw action in 36 games (20 starts) in three seasons at Massachusetts ... Posted 84 catches for 1,338 yards (15.9 avg.) with 11 TDs ... Began his collegiate career at Syracuse University. 2009: Played in 11 games (eight starts) ... Totaled 22 catches for 297 yards (13.5 avg.) ... Added one carry for nine yards ... Also blocked a punt that resulted in a touchdown. 2008: Started all 12 games ... Notched 50 catches for 895 yards (17.9 avg.) with eight TDs ... Recorded six carries for 23 yards (3.8 avg.). 2007: Saw duty in 13 games in his first year at Massachusetts ... Totaled 12 catches for 146 yards (12.2 avg.) with three TDs ... Added 10 kickoff returns for 195 yards (19.5 avg.). 2006: Played in seven games primarily on special teams duty as a redshirt freshman at Syracuse ... Returned one kickoff for 20 yards (20.0 avg.). 2005: Redshirted as a true freshman at Syracuse ... Majored in Sociology at Massachusetts. High School: Amassed 28 catches for 484 yards (17.3 avg.) with six TDs as a senior at Milford Academy in New Berlin, New York ... Added six rushes for 35 yards (5.8 avg.) ... Added 17 catches for 400 yards (23.5 avg.) as a junior. Single, with a daughter Jade (4). View the full website biography of Jeremy Horne.